Regular readers might recall that our barbecue blew away last fall. During a big wind storm in September our new barbecue blew off the deck and into the lake. Fortunately this happened one morning when our neighbour, Kuzman, happened to be at home and looking out his window. He saw a grey shape floating past our house, and just when he was about to go out and rescue the mystery object, it rolled over and sunk out of sight. We weren’t able to bring it up again as the lake was murky after the wind storm, and stayed that way, and so while we had a rough idea of where it was, we couldn’t locate it. Last weekend Martin and Kuzman decided it was time to bring the barbecue back up from the ‘basement’, as we like to call the 10 feet of water under the house. (We’ve inadvertently lost a few items in the basement over the last two years, but none as big as the barbecue before now.) First they called up our fisherman friend Greg, and he came over with his underwater camera. Luckily we had some idea of where to start looking for it. 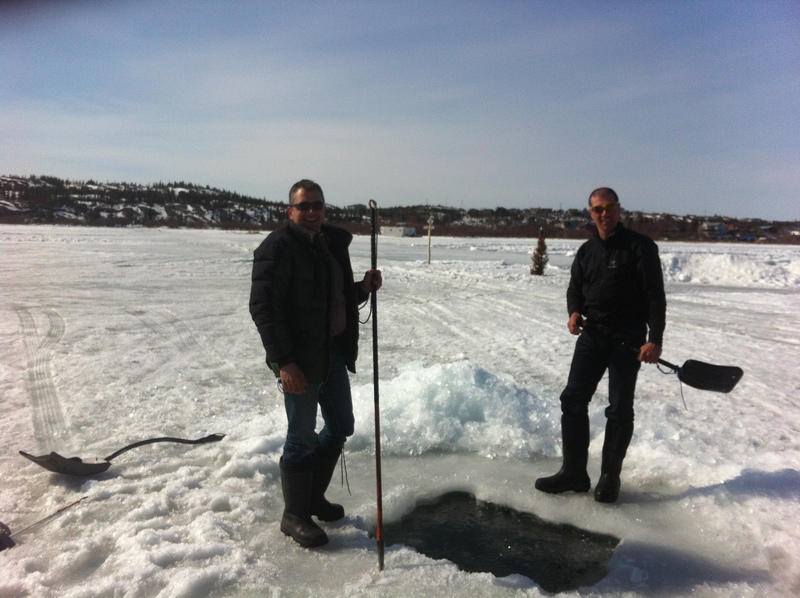 After drilling 3 holes in the ice, and with the help of the camera, it was located! Upside down in about 10 feet of water. 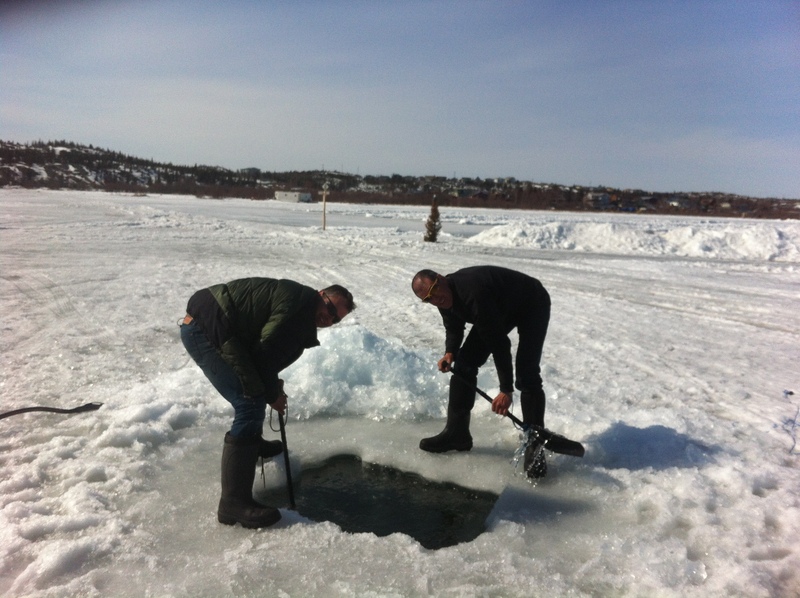 Kuzman and Martin then spent the next 5 hours manually cutting a barbecue sized hole in the lake ice, nearly 4 feet thick. 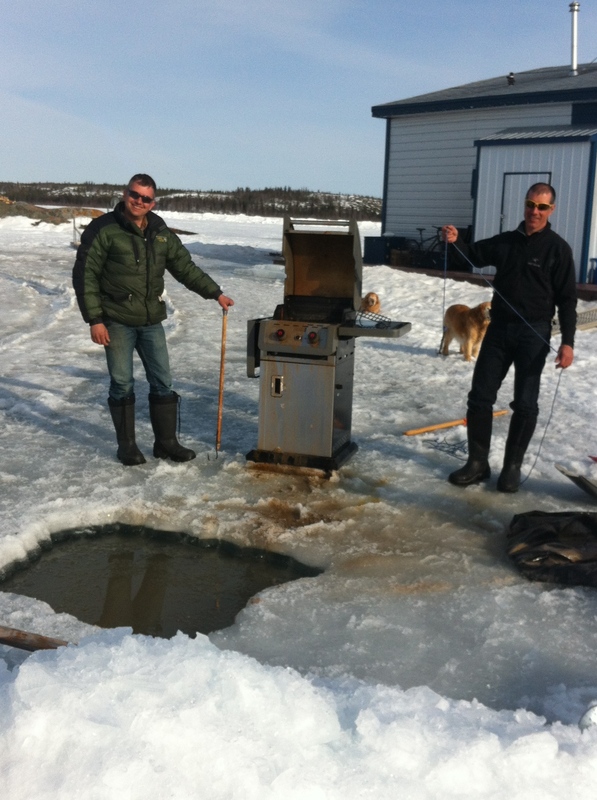 Once the ice was opened up, it was easy to see the barbecue, but not at all easy to bring it up. Using big strong fish hooks on thick rope, it was eventually pulled up from the bottom. It sounds straightforward but this too took quite a bit of time. It still had the cover on, now full of water, and various bits that wanted to catch on the thick lake ice. Eventually, they succeeded. Because the barbecue sunk, and was recovered, with the cover on, all the accompanying parts where still there too – the grill, the grill cleaning brush, and the propane tank. After an hour with the power washer, it looked nearly new again – just one small dent in the door and a bit of rust stain on the handle. Martin was even bold enough to try to start it up, and to my surprise, it fired up without difficulty, and works as well as ever. (Although the ignitor no longer works.) It’s a Coleman brand – I wanted something heavy duty and well built and I think it has passed all tests with flying colours! It took the two men all day to bring the barbecue up, but this large catch of the day made it all worth while. It all went so well that we might just store it in the ‘basement’ again next winter. Our neighbour came along near the end to check on our progress. We spoke with him about the houseboat reality show that is being filmed in our neighbourhood right now, and he thought they should have filmed this. This IS houseboat reality! This entry was posted in The Song I Live By and tagged extreme houseboating, ice fishing, The Song I Live By. Bookmark the permalink. That is NOT what I had in mind when I heard the story of the grill’s sinking the first time, or even when I was reading this post! My goodness! After I got over its size, i started thinking about the fact that it started up, and then I remembered: fresh water, not salt water. Yes? Here, the bottom is so soft that anything of substance that goes in heads toward the center of the earth. You sometimes can get car keys or sunglasses back, but the bronze bow roller that went “Kerplunk”? Not a chance. Likewise: the lime green Snap-On ratcheting screwdriver, the innumerable Radio Shack transistor radios, the full fifth of good rum, etc. etc. Another great story! I have had some serious catching up to do and have enjoyed your blog. My son is beginning a new adventure in Yellowknife and we will be living his adventure virtually. Knowing him as I do, I will be looking elsewhere for colour and stories to flesh out his. Like many young people, he sees everything as adventure and fails to see that the excitement he`s living is unique to many armchair travellers. I will continue to enjoy your writing as well as share nuggets of information that might make his life even richer while he`s there. Thank you for sharing. Thanks for stopping by. I hope your son enjoys Yellowknife as much as I do. Be warned – this town is FULL of people who came for a month, or a year, and never left. You may yet come up for a visit yourself!